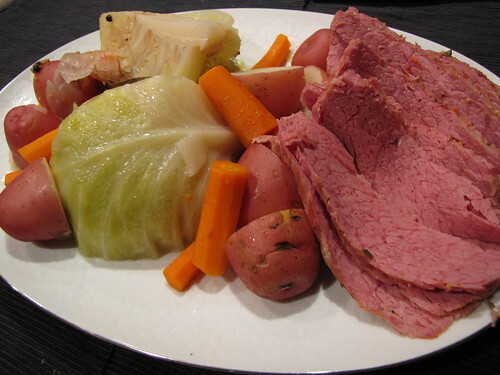 Corned Beef & Cabbage – Irish Boiled Dinner. Perfect for St. Patrick’s day! In my world, some holidays like Christmas, Easter, Valentines’s Day and New Year’s Eve/Day are open to many dining options. Pretty much anything from ham to beef to fondue works for me when in search of a festive meal. Honestly, for most holidays and special occasions I’m more than happy to throw a couple of good fillets from McGonigle’s on the grill, bake a couple of potatoes, and open a nice bottle of wine. However, thou shalt not mess with the food for two holidays – Thanksgiving and St. Patrick’s Day. I require turkey in November and Corned Beef and Cabbage in March. Since my St. Patrick’s Day meal will be exactly the same this year as it was last year, I’m repeating this post on the glories of Corned Beef & Cabbage. 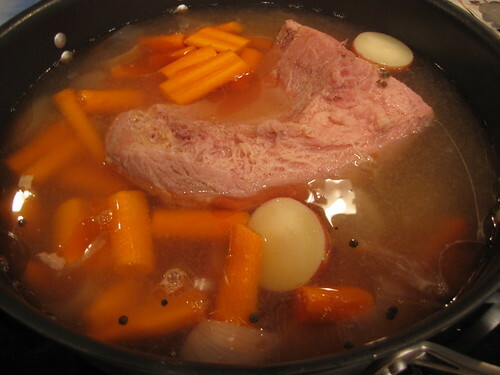 If you’ve never made an old fashioned Irish Boiled Dinner, now is your chance! 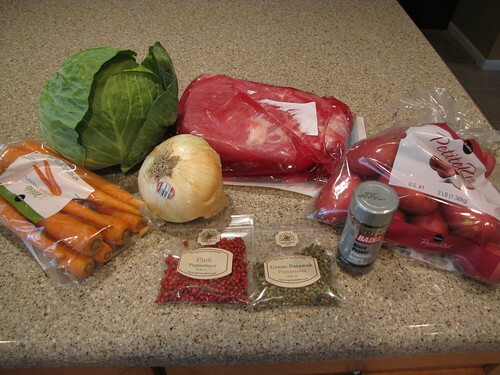 Corned Beef Brisket*, Cabbage, Onion, Red Potatoes, Carrots, Peppercorns (I have a variety but plain black peppercorns are fine), Bay Leaves & Apple Cider Vinegar (not pictured). Note: For a 4 pound corned beef (enough to feed 4 people) you will need at about 3 hours of cooking time. Plan ahead. 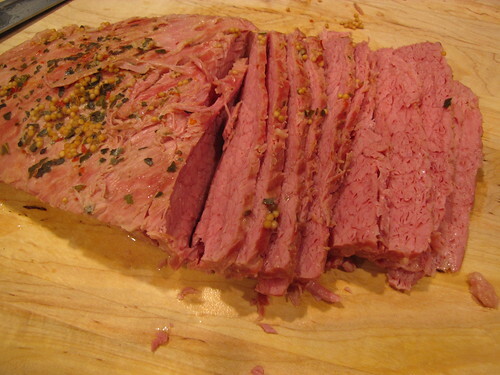 *Corned Beef is basically a brisket that has been brined or salt cured. In addition to salt, there is usually a variety of spices including whole mustard seeds, pepper corns, and bay leaves. Sometimes these spices are in the brining liquid around the meat and sometimes they are in a separate small packet included with the corned beef. You can brine your own, but there are good ones available this time of year in almost every store. Look for what they call a flat brisket or flat cut corned beef and take a look at the side of the meat to try to find one that doesn’t have too much fat running through the middle of the meat. 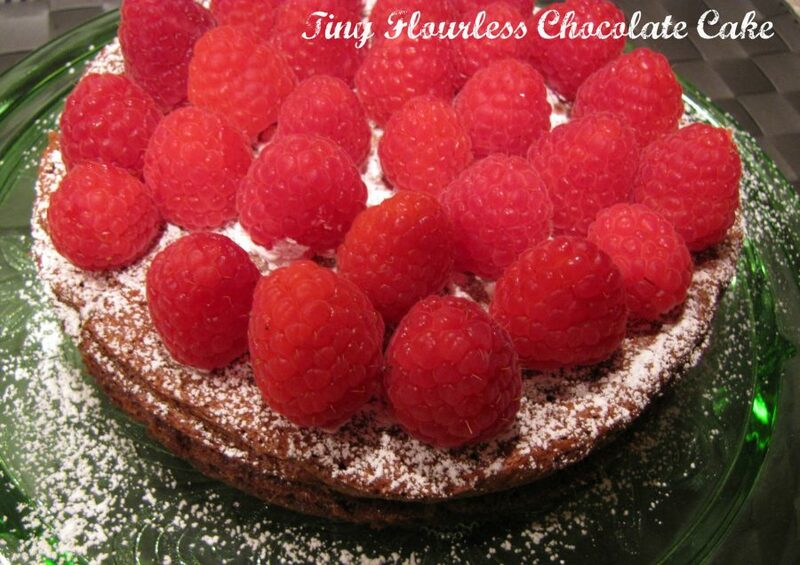 This will make slicing much easier. Take the corned beef out of its plastic packaging. 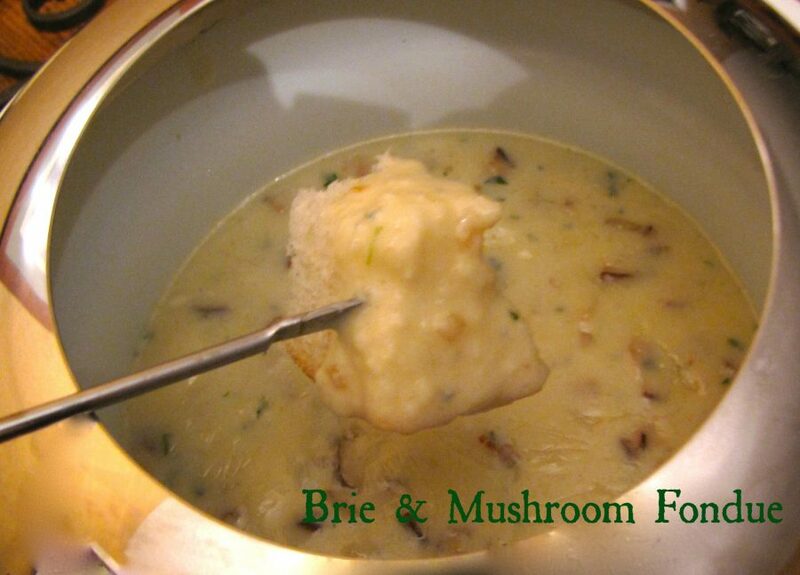 Some people like to use the brining liquid included in the package for cooking. I would do this if the spices are floating around in the brine. Otherwise, for me it is salty enough without adding the liquid from the package. 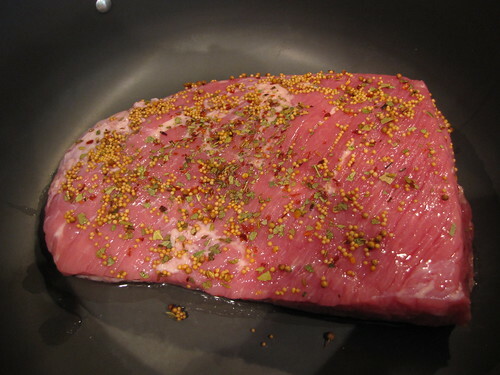 Take the little packet of spices and rub them on the “good” side of the corned beef that does not have the layer of fat. You will want to use a HUGE pot if you have one. Eventually all of the veggies will go in this pot so plan to have plenty of room to spare. Add water to just cover the top of the meat. Peel an onion and cut it into quarters and add it to the pot. Add 1 Tablespoon of peppercorns, 2 bay leaves, and 1/4 cup of cider vinegar. I had some green and red peppercorns that I wanted to use up but most of the time I just cook this with plain old whole black peppercorns. Bring the pot to a boil, cover with a lid, turn the heat down to low and simmer for 2 hours. Note: Most recipes advise to cook the meat for 1 hour per pound. I have never actually used the entire cooking time recommended. I have about a 4 pound corned beef and it cooked for just over 3 hours total. 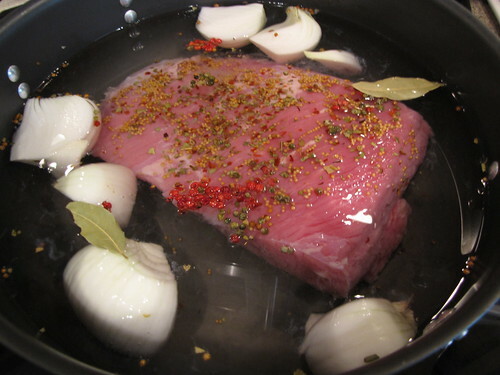 It’s a good idea to occasionally turn the corned beef over in the cooking water so that the spices don’t just float on top. After 2 hours of cooking time, add 1 pound of carrots that have been peeled and cut into 2-3 inch chunks and 2 pounds of red skinned potatoes. If your potatoes are really small you can leave them whole or cut them in half or quarters if they are a bit bigger. 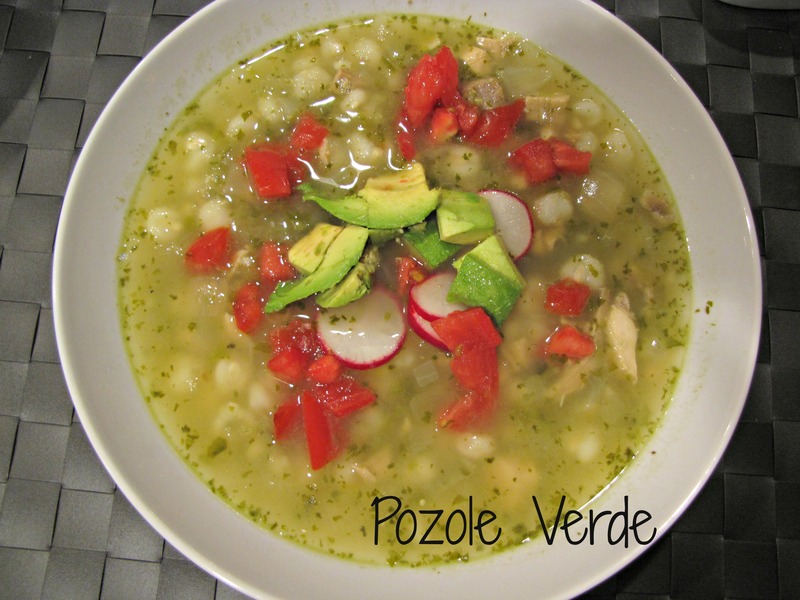 After adding the veggies, you might need to bump the heat up just a bit to return the pot to a boil. Once it is boiling again, cover with a lid, lower the heat and continue to simmer. Prepare a head of cabbage by removing any outer dark green leaves that are not tightly wrapped around the outside. 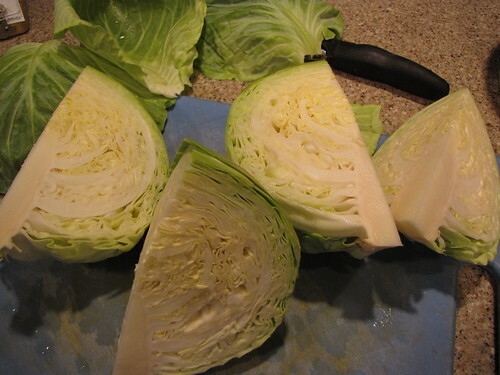 Cut the cabbage into quarters leaving the core intact. After the carrots and potatoes have cooked about 30 minutes (2½ hours total cooking time so far), add the cabbage and submerge it in the cooking water. Once again, return the pot to boiling then reduce the heat and simmer with a lid on for a final 30 minutes. 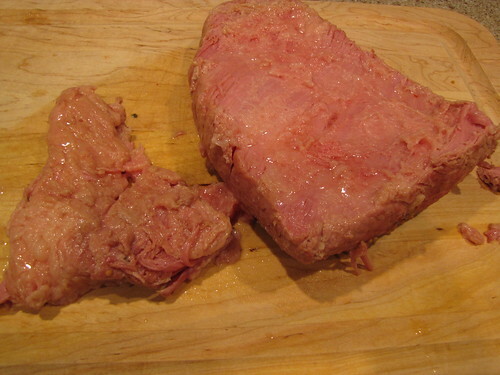 The corned beef is done when it is tender when pricked with a fork. 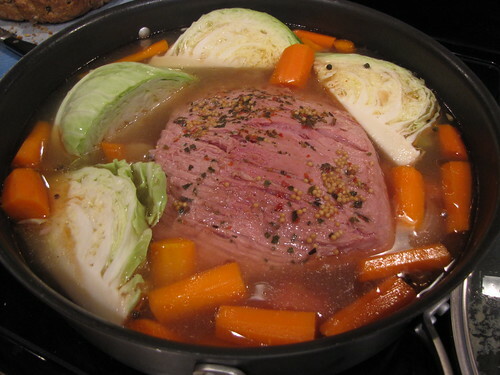 Remove the corned beef from the pan and let it rest for at least 10 minutes before slicing. OR my dad recommends putting the corned beef in a low, 200 degree oven for 5-10 minutes to help it dry out a bit. This allows you to slice the meat much thinner and keeps the slices from falling apart. 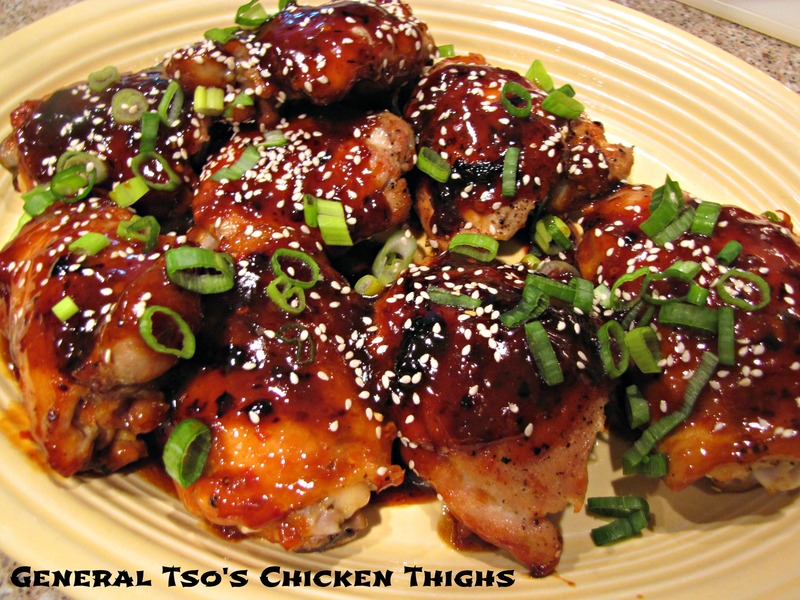 When you are ready to slice the meat, turn it over and remove the layer of fat and discard. Cut the corned beef AGAINST the grain into very thin slices. Strain the cabbage, carrots, and potatoes from the cooking water and serve with the warm sliced meat. I like a little butter on the cabbage. Jim likes some spicy brown mustard. While you’re at the store buying corned beef & cabbage , I think you might as well pick up some rye bread, swiss cheese, and kraut so you can make Reuben Sandwiches with the leftovers. You can keep the green beer. I’ll have seconds of corned beef & cabbage. We totally blew it this year: no Guinness in the house, no corned beef, not even a cabbage! But with your help there is hope for next year.